Date of Conviction: Information May 18, 1918. Allegations: No details in record. Words spoken May 10, 1918. Case Details: Convicted in trial in Jan. 1919. 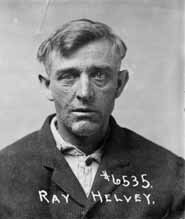 Sentenced Jan. 18, 1919. Served 19 months. Released Aug. 15, 1920. Personal Information: Born in Nebraska. Was a farmer. On 1918 draft registration card, listed nearest relative in Omaha. Date and place of death not known.